The story opens with two men flying on a plane that’s landing in New York City. The duo is lead by a tall man with a moustache, his comapnion, Hadji, is a short, fat fellow. Before the craft lands, the moustached man explains that he’s delighted to have finally found the idol that he’s been searching for. The object is located at “Second Time Around,” a name that should ring some bells for readers, as it’s April’s antique store. Hadji asks if his partner plans to buy the statue, and he’s told that it must be stolen. As the pair depart the plane, the tall man shakes the captain’s hand in thanks. As they walk off, we see that the moustached character has actually stolen the captain’s wristwatch! The fat man asks if they’ll head to the shop immediately, and his cohort explains that they’ll first need to recruit some help… as he eyes a homeless man sleeping on a nearby bench. Later, the moustached man walks into April’s shop, asking to see something “grotesque.” April shows him a small statue of a six-armed monster that’s “priced to move.” The fellow is delighted with the statue, but claims to have forgotten his wallet and walks out, leaving a bewildered April behind. That night, we see three masked men peering into the window of “Second Time Around.” The TMNT are upstairs carving pumpkins when the burglar alarm in the antique store goes off. Don thinks that Clunk the cat has set off the alarm again and heads downstairs to check – he soon discovers the three masked men and a fight breaks out. One of the thieves manages to push a bookshelf onto Don and two of the men escape. The other three Turtles arrive and help Don to escape from the bookcase. Donatello grabs the crook that he’d knocked out and tries to get him to talk. The man is dazed and confused, but manages to tell the Turtles that they’d been forced to steal the statue, and that it had been taken to the Blue Star Hotel. Suddenly, the man begins to choke and he quickly dies! Leonardo tells his brothers to gear up – they’re going to the Blue Star Hotel to investigate. The Turtles soon arrive at the hotel and burst into the thieves’ room just as the tall man is in the middle of some strange, magic ceremony. The Turtles state that they don’t want any trouble – but they do expect to get paid for the statue. “Two dollars! Two dollars!” demands Raphael. The man cries out that they’re too late and finishes his incantation – which causes hundreds of little monsters to erupt from the statue of the Thieving God. 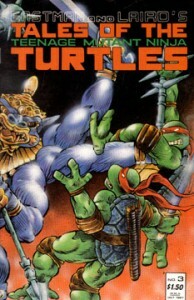 The creatures attack and distract the TMNT long enough for the sorcerer and his partner to escape down a stairway. The Turtles soon offer chase, and when they emerge on the streets below, they see the little beasties swarming into the streets of New York, looting as they go. The short man spots the Turtles and warns his boss, who takes the idol and invokes another spell – one that brings the statue to life! The TMNT attack the monster but the fight does not go well. The creature systematically disarms the Turtles and leaves them in a quandry. Don thinks up a plan and the Turtles run, taunting the beast into chasing them. Meanwhile on the streets, the sorcerer is again gloating that he has unleashed the power of the mightiest thieves of all time – now the Thieving God and his minions were his to command! The Turtles have climbed to the top of a building and are waiting for the Thieving God monster to arrive. Soon enough the creature turns up, but as soon as it’s gained its footing on the rooftop, the TMNT strike! The force of their attack knocks the living statue from the roof and it falls six stories to the pavement below – crashing through the street and leaving a large, smoking crater. The little summoned demons begin to disappear – apparently with their master destroyed, they can no longer exist. Mikey spots the wizard and his henchman fleeing, and Don throws his staff, tripping the two up. The police arrive soon and arrest the tall man and Hadji, as the looting demons have left a stockpile of stolen goods for the pair to take the wrap for. One police officer tells the Turtles to get back to their trick or treating. The Turtles smile and walk off. “Nice kids.” Notes one cop. “Yeah, but weird costumes!” remarks a detective.